As a general, non-taxonomic term, insectivore is a dietary category that applies to any organism feeding chiefly on insects and similar small creatures. Thus, insectivores are specialized carnivores. As with other dietary categories, the term delineates a heterogeneous group of animals from many phyla and classes, as well as some plants. Taxonomically, however, this term was once specific for members of the mammalian order Insectivora, a biological grouping, now largely abandoned, of small to very small, relatively unspecialized, insectivorous mammals. This article will be limited to the use of the term as a dietary category, not the taxonomic one. Although insects belong to one order (order Insecta) of one phylum (phylum Arthropoda) and are individually small, they exist in diverse forms and in enormous numbers and make up a very large part of the animal biomass in almost all non-marine environments. In Queensland pastures, for example, it is normal to have a greater total weight of Scarabaeidae larvae under the surface than of the beef cattle grazing above it (Roberts and Morton 1985). For this reason, just like plant communities support herbivores and animal populations support carnivore, the insect population support insectivores. Insectivores establish the prey–predator relationship with insects, and thus contribute to the delicate balance of the natural ecosystem (Taylor et al. 2003). Insects occupy a wide variety of habitats in nature, both aquatic and terrestrial and even in extreme temperatures. The presence of a wide divergence of insectivores indicates that insects are sustaining a wide diversity of trophic levels higher than themselves. Insectivores are not limited to animal genera. There are some plants that eat insects. The plant insectivores include the Venus flytrap (Dionaea muscipula), Cobra Lily (Darlingtonia californica), several types of pitcher plants (Nepenthes sps. and Sarracenia sps. ), butterworts (Pinguicula), sundews (Drosera), bladderworts, the waterwheel plant (brocchinia bromeliads), and others. However, their dependency on insects is not exclusive. Insectivorous plants have adapted to grow in poor soil conditions where the number of microorganisms recycling nitrogen compounds is very much reduced. So, these plants solve the limitation of their habitat by capturing and digesting live prey (normally insects) and obtaining nitrogen compounds from them (Garden Helper 2007). Technically, these plants are not strictly insectivorous, as they consume any animal small enough to be trapped by them; there are larger varieties of pitcher plant that have been reported to consume small rodents and lizards. Further, there are other types of plant insectivores that trap insects on their sticky leaves, let them die and decay naturally, and get benefit from them when the nutrients released are washed into the soil. Schoenly (1990) has reported six phyla and thirteen classes of non–insect insectivores in a study of invertebrate–dominated food webs. Some of the non–insect invertebrates preying on insects are spiders, scorpions, crabs, centipedes, and so forth. Many insects are efficient predators of other insects, thus playing double trophic level roles in the dynamics of food chains and food webs. Some of the common insect insectivores are dragonflies, hornets, ladybird beetles, praying mantises, and many others. From counts of insect predator–insect prey links, hymenopterans as terrestrial predators were found to interact with the most number of the insect taxa (Schoenly 1990). All the major groups of chordate have insectivores. Even there are fishes like sticklebacks, minnows (Gambusia), trouts, carps (Cyprinus), and others that selectively feed on aquatic insects, insect larvae, and pupae. Frogs, toads, lizards including wall lizard (Hemidactylus), and many types of birds are insectivores. Class Mammalia consists of two groups which are especially recognized as the insectivores. They are the anteaters and Insectivora. The representatives of the historical biological order Insectivora are actually known as insectivores and include shrews, moles, hedgehogs, tenrecs, and solenodons. These insectivores are small animals, ranging from 2 to 16 inches (5-40 centimeters) in length; they are generally quite active, and most of them are nocturnal. Generally, insectivores have a small brain and unspecialized teeth. Most insectivores have poorly developed eyes, small ears, and a long, pointed snout. They feed on a variety of small animals, particularly worms and insects. However, several members of the Insectivora do not eat insects. 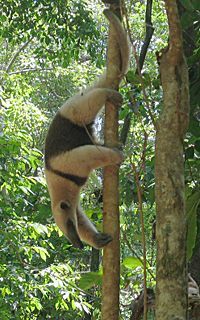 "True anteaters," namely the Pygmy Anteater (Cyclopes didactylus), Giant Anteater (Myrmecophaga tridactyla), and Lesser Anteaters (Tamandua tetradactyla and T. mexicana), as well as other so-called "anteaters," like the echidna (spiny anteaters), the numbat (banded anteater), aardvark (cape anteater), and the pangolin (scaly anteater), are insectivore as they chiefly feed on ants and termites. Bat, bear, and a numbers of other mammals are also found to feed on insect meal. Some insects, like grasshopper, locust, and others, are also eaten by people. Being rich in protenaceous nutrients, insect meals are often suggested for human consumption. Insects, being well adapted to many environments and able to multiply very rapidly, have the potential to have significant population outbreaks, causing severe imbalances in the natural ecosystem. From this perspective, insectivores can be seen to have very important natural roles in preventing such imbalances, as well as in biological control of insect populations. In most cases, biological control of insects and mites is carried out with other insects and mites as natural enemies. Larger pests, such as caterpillars, and also phytophagous bugs, can be controlled in greenhouses by making the best choice of an insectivorous bird. The use of Alcippe brunnea (Passeriformes: Timaliidae) against caterpillars are very promising (van der Linden 1999). Thus, biological control is widened from an entomological to a more general ecological approach. Birds and bats are important insect predators, particularly during the spring when they are raising young. Birds are generally active during the day and feed on caterpillars and other insects, while bats feed during dusk and into the night on insects that are a nuisance to humans. (A small brown bat can devour up to 600 mosquitoes in an hour.) Furthermore, they can remove agricultural pest every efficiently. In one season, a typical colony of about 150 big brown bats in the Midwest eats 50,000 leafhoppers, 38,000 cucumber beetles, 16,000 June bugs, 19,000 stink bugs, and not to mention thousands of moths, such as adult cornborers, earworms, and cutworms (ATTRA). In one study in Egypt, it was found that elimination of the wild flora, and consequently the associated fauna, through land reclamation in the desert arid areas led to the emergence of the pubescent rose chafer (Tropinota Squalida), as an economic pest causing large damage to flowers of different crops. Pest control was achieved only after conserving the wild flora and encouraging the principal insectivorous natural enemy of the beetle, namely the shrew (Crocidura sp.). This specialized predator vigorously consumes subterranean insects, including large numbers of Tropinota larvae, pupae, and aestivating adults around the year (El–Husseini et al. 2004). Through the general survey of the insectivores, one can conclude that, corresponding to the diversity and abundance of the insects, insectivores are also found in similar diversity and abundance and are keeping the ecological balance of the former through prey–predator interaction. ATTRA. Farmscaping to enhance biological control. Pest Management Systems Guide. ATTRA - National Sustainable Agriculture Information Service. Retrieved November 14, 2007. El–Husseini, M. M., H. E. A. Bakr, S. S. Marie, A. O. Naglaa, M. F. Hydar, and M. S. Nada. 2004. Preservation importance of biodiversity in the newly reclaimed land for keeping the natural balance. Case study: The rose chafer, Tropinota squalida (Scop.) (Coleoptera: Scarabaeidae). Egyptian Journal of Biological Pest Control 14(1): 299-304. Retrieved November 14, 2007. Garden Helper. 2007. Carnivorous insectivores: A guide to growing carnivorous plants. Free Internet Guides to Gardening. Retrieved November 14, 2007. Roberts. R. J., and R. Morton. 1985. Biomass of larval Scarabaeidae (Coleoptera) in relation to grazing pressures in temperate, sown pastures. The Journal of Applied Ecology 22(3): 863-874. Retrieved November 14, 2007. Schoenly, K. 1990. The predators of insects. ECOL. ENTOMOL 15(3): 333-345. Retrieved November 14, 2007.
van der Linden, A. 1999. Insectivorous birds for biological control of pests in glasshouses. Research Station for Floriculture and Glasshouse Vegetables, Naaldwijk (Netherlands). Retrieved November 14, 2007. This page was last modified on 22 April 2014, at 21:42.